The most important thing for a dog’s physical and mental health is exercise! If you find that your dog is left home alone for long periods of time while the rest of the family is away at work or school, let us help you with our Midday Dog Walking service. A walk breaks up their long day home alone and gives them mental and physical stimulation. Schedule with us for every work day or on an as needed basis, our service is flexible around your schedule! Your walk will be at a set time everyday so the dog(s) get into a routine and you will be assigned a primary walker so they will build a repor with your dog(s). The average distance of the walk is around one mile, but that depends on your dogs pace. We do not charge per dog (up to 3 dogs) and we will walk in any weather that your dogs are willing to walk in, you tell us what is too cold, hot or inclement weather to walk in. 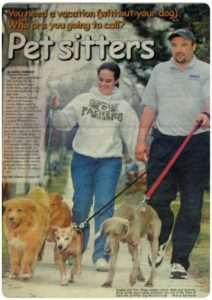 All of our dog walkers are fully insured and have a list of Veterinarians, Police Departments and the Humane Society in the area in case of emergency. We guarantee to be there every day you need us, no matter the weather or if your assigned walker is sick or has a day off, we have backup walkers available. Daily dog walks are available (7) days a week and done between 10:00am & 5:00pm.